Since the 1930s, the Department of Art History & Theory lantern slide collection has been stored in its original wooden cabinets. This means the slides were stored back-to-back in drawers without suitable protection, or clear organisation, which exposed them to damage from insects, dust and movement (including earthquakes). It also makes searching and extracting slides difficult for users of the collection. This project provided an opportunity to investigate how to improve storage and access to the collection, using the WWI battlefield memorial sub-collection as a trial project. 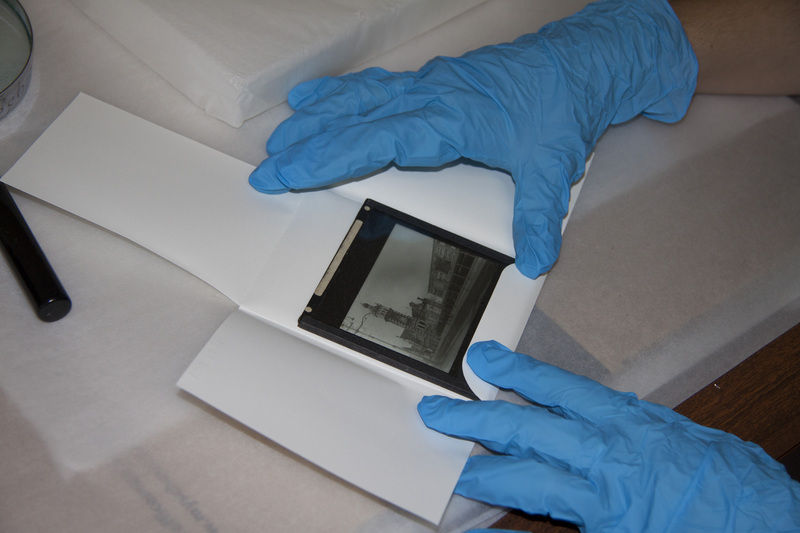 The following is an overview of how we prepared the lantern slides for physical and digital preservation. Without surviving documentation, there is no way to know which subjects are covered in the collection, the state of the slides, or the order in which they are arranged. To rectify this, the physical and pictorial details of each slide were recorded in a spreadsheet, including a short description of the image, sizes, and any inscriptions. Slides were then assigned a unique ID (the accession number). The condition of each slide was also recorded in a brief condition report, which was used to guide our cleaning of the slides and any future conservation work. Collecting data in this way made it easier to later transfer it into the Omeka database and also helped us to plan ahead for the other tasks. After a slide was catalogued, it was given a careful clean. The most common treatment required was the removal of dust and loose grime with a soft brush. For stubborn surface accretions, slides were given a wet clean using cotton buds and a water-ethanol solution, while ensuring that no moisture touched the paper binding the glass plates together. To reduce the risk of physical damage to slides throughout the project, we handled them as little as possible while wearing nitrile gloves in a clean workspace, with some padded surfaces for the slides to rest on. Each lantern slide was placed in an acid-free four-flap enclosure, labelled with its accession number in pencil. The slides were stored vertically in a cabinet and interleaved every inch with corrugated card. 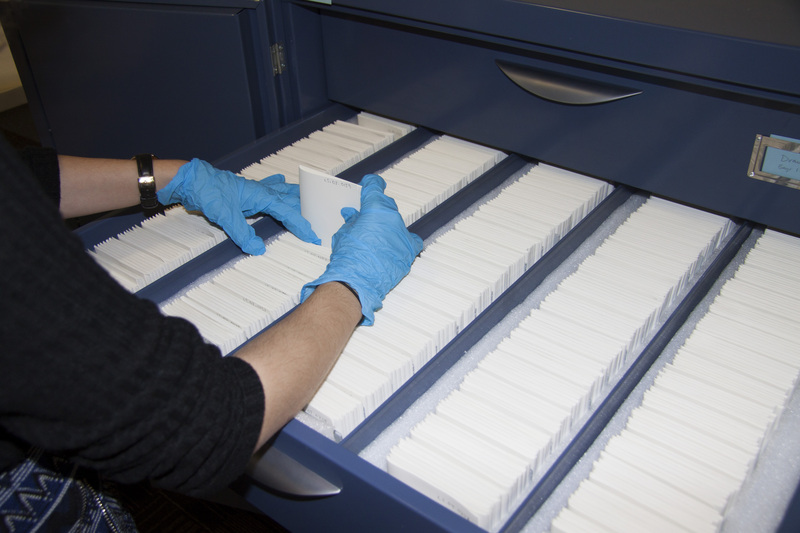 Each drawer is lined with foam so that the slides are snug and won’t shift during movement. 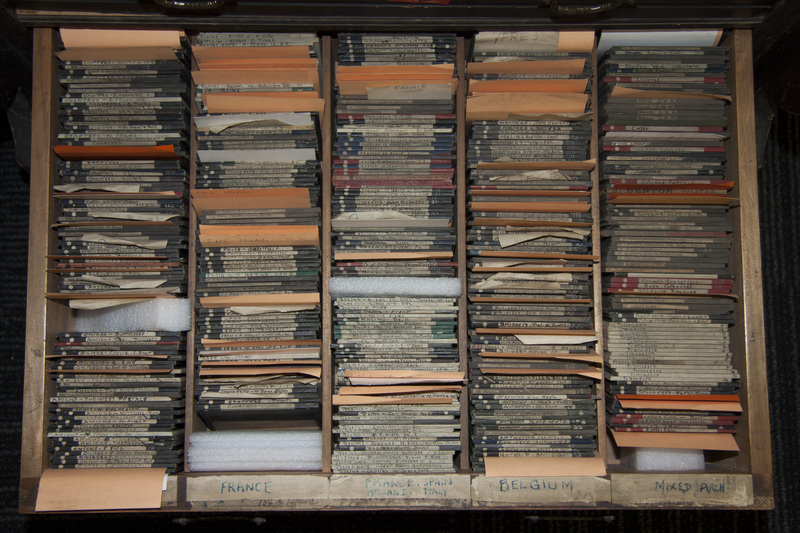 Damaged slides are stored horizontally inside their enclosures (sandwiched with extra card), in shallow stacks in a separate drawer to prevent any further damage. Our aim in digitising the lantern slides was two-fold: we wanted to create archival copies that could digitally preserve the data present in the actual slides, and from these ‘master’ copies, we could make derivative ‘access’ files for use on the website, printing and projection. The master scans can also act as a record of the condition of each slide and can be compared to the actual lantern slides for future conservation work. The raw scan files were saved under their corresponding accession numbers and backed-up on an external drive. The slides were scanned on a Nikon Super Coolscan 500 ED using a custom-made mount. To contend with the optical effect caused by Newton’s rings we adjusted the height of the mount to capture the entire slide as an object during the reflective scan; to capture the slide’s photographic emulsion we simply retained the mount’s original height. To capture the handwritten labels on the slide edge, a small card mount was made to stand the slide up and a camera and tripod positioned above it. Because scanning the slides doesn’t always mean that every detail will be captured accurately, most of the scans were adjusted for brightness and colour. However, this was to bring the image as close as possible to the original photograph or object, rather than to enhance the image’s readability on a screen. On the Omeka platform we combined a close-examination style display of an individual slide alongside its data. A selection of the information gathered during cataloguing is shown beneath the four different views of each slide: the face (front), verso (rear), top slide edge, and the photographic image. Seven of the WWI slides are glass plate negatives, which comprise a negative image on one piece of glass and have no object inscriptions. For these, we captured the face, verso, the photographic image as it is (a negative), and produced an inverted, or positive, image. Including these different views allows users to view the pictorial and physical information of the lantern slides, as well as their condition. We also used Omeka's Getty Suggest plug-in, which connects to the Getty Research Institute's Art and Architecture Thesaurus, to help keep the cataloguing metadata standardised across the database feature of the site.